Yes I’m saying about legendary American activist Pete Seegar. 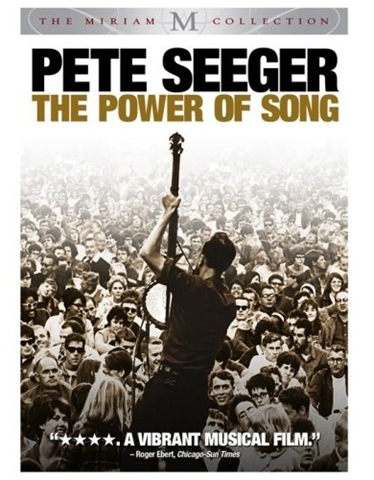 Perhaps no single person in the 20th century has done more to preserve, broadcast, and re-distribute folk music than Pete Seeger, whose passion for politics, the environment, and humanity have earned him both ardent fans and vocal enemies since he first began performing in the late ’30s. His never-ending battle against injustice led to his being blacklisted during the McCarthy era, celebrated during the turbulent ’60s, and welcomed at union rallies throughout his life. His tireless efforts regarding global concerns such as environmentalism, population growth, and racial equality have earned him the respect and friendship of such political heroes as Martin Luther King, Jr., Woody Guthrie, and Cesar Chavez, and the generations of children who first learned to sing and clap to Seeger’s Folkways recordings must number in the millions. Rising above all of Seeger’s political ideals and his passion for authentic folk music is his clear voice and chiming banjo which both sing out with a clarity that rings true. The film is a good one… A testimonial of the fact that Seeger’s music does not force hate to surrender with muscle or intimidation, but with Seeger’s simple honesty and pure-hearted clarity which has truly changed the course of history during the 60-plus years that he has been performing. Honestly, we hardly felt the urge to know who the singer was, when we used sing “We shall overcome… ” Thanks for throwing some light on the American Folksong culture. He’s truly a reformer.